BASH, BASH, BASH…. WHAT AN EXCITING TIME!!! If they say all Corvettes are red, then are all Corvette Engineers red plaid? Last Spring our Registry magazine displayed a priceless photo of then Plant Manager Wil Cooksey, Retired Chief Engineer David Hill and Vehicle Line Executive Tom Wallace at last year’s Birthday Bash wearing the infamous Red Plaid Pants. Well, the tradition continues! At this year’s Margaritaville Party during the Registry Bash, Retired Plant Manager Wil Cooksey, who is now Chairman of the Board of the National Corvette Museum, gave Tadge Juechter, Chief Engineer Corvette Future Products, his own pair of Red Plaid Pants AND a matching red plaid button down driving cap! Now that’s a new twist! Everyone agreed that Tadge was quite the fashion statement at the Margaritaville Party. It looks like Harlan Charles, Corvette Product Manager, is next in line for the coveted David Hill Red Plaid Pants Society! (I was just thinking, if our guys are wearing stylish Red Plaid Pants, just what are the Viper and Mustang engineers wearing at their enthusiast gatherings?) 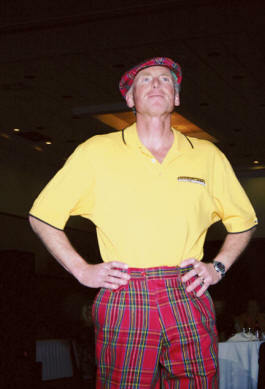 So at next year’s C5/C6 Bash, all bets are in that you will see the Red Plaid Pants tradition continue as our Chief Corvette Engineers don their plaid apparel for the Margaritaville Party. It’s becoming quite the tradition! this red plaid outfit with a matching driving cap! The Italian Stallions, Chief Designer of the 5th Generation of Corvette, John Cafaro and Director Dan reminisce on past Bashes. I know I’ve said this before and I’m going to keep saying it: One of the greatest features of the C5/C6 Registry Bash is the accessibility of Corvette Engineers, Corvette Management and Corvette Plant Personnel present for you, our members, to engage in a two-way exchange of vital information regarding our beloved Corvettes. I know of no other event on this planet where you can interact with Engineers by day and (my favorite part) PARTY with them all night long! 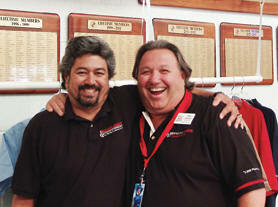 This brings Corvette Management closer to their customers and the customers closer to Corvette Management. Members, when at future Registry Bashes, remember, this is your opportunity to exchange valuable information with those who can make a difference! This is sometimes an overlooked part of the Bash, but I believe this is the most important part. I know of no other car company that allows such a high level of customer interaction on such an intimate scale. I’m still licking my fingers from Chef Extraordinaire General Custer’s smokin’ barbecue, and all of you must be too! I’ve received tons of emails sharing with me how much FUN everyone had at our early arrival kick-off party on Thursday night hosted by Jim Van Dorn of Auto Masters. Jim outdid himself this year by booking the very hot and popular local band Blue Light Special. I wanted to make sure I got to know each of the band members personally as I was told they were all Bowling Green Police Officers! Their music was outstanding and everyone had a great time dancing the night away! Something about partying inside a working garage of Corvettes just brings out the gear head in me. So when you go to Bowling Green to tour the Museum and Plant, there is now a third stop you should definitely add to your list… a visit to Auto Masters to say Hi to Jim Van Dorn. He is a true friend of the Registry and its members! We were also introduced to Mike Hoover and Dave Chrisley, Co-Founders of the Bowling Green Assembly Corvette Club which has been in existence for about a year now and their membership is growing daily. I love their club motto, "We Build Your Dream In Bowling Green." Anyone can become a member. Director Jake and I joined in March. All you need to do is visit their web site at www.BGACorvetteClub.com and sign up. 2008 and introducing Paul Graham, Bowling Green Assembly Plant’s new Manager. It is always an entertaining evening whenever Wil speaks, and this night was no exception. I had a hard time hearing Wil’s speech because of all the laughter. You can tell he’s retired now because there was no holding back on his thoughts! This was a chance for those in attendance to visit with Wil and share with him how much he meant to them. This evening marked the official introduction of Paul Graham to the Corvette world as the new Corvette Plant Manager. 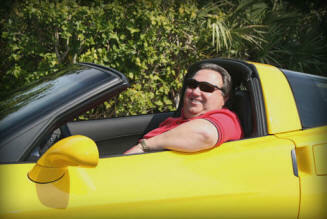 Paul impressed me as a real go-getter and an individual who really has Corvette Quality on the brain. He shared with me that he expects to continue turning out the best Vettes yet, and make each year a higher quality vehicle than the year before. Personally, I believe that’s quite a task, but I know Paul is up for it. I wish him great success with his endeavor as Plant Manager, and we all look forward to driving the future Corvettes coming out of the Plant. He has big shoes to fill, but I noticed he has pretty big feet, so I am confident it will work out great! Thank you, Paul, for all you do and continue to do for Corvette. I know you will be a great asset to the Corvette community. If you have not met Paul in person, he will be the guest speaker at our Carlisle dinner on Friday, August 22, 2008. 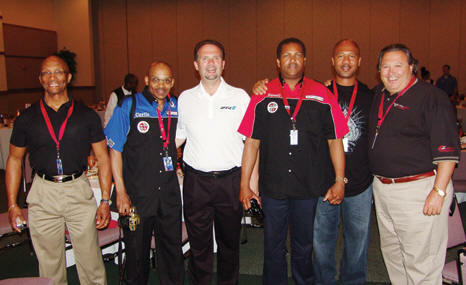 (L-R) Members from Chicago’s INSIDETRACK CORVETTE CLUB, Darryl Humbles [C5R# R7996], Curtis Davis [C5R# P7900], Bowling Green Corvette Plant Manager Paul Graham, Russell Williams [C5R# Y3601], Anthony Gatewood, and Director Dan were all on hand to welcome Paul to the family! When you get a chance, please be sure to thank Roc Linkov, NCM Event Manager, for his dedication and effort in making the Bash so successful year after year. The Registry created this event some 11 years ago, but it is Roc who has perfected it and turned it into one of the greatest Corvette events of the year. Please join me in a BIG C5/C6 REGISTRY THANK YOU to Roc and the NCM Staff for all their help in making the C5/C6 Bash what it is today! So let’s all have a Safe and FUN filled Corvette summer!